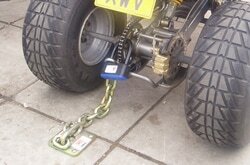 16mm Dia long link security chain incorporated into a Ground Anchor. 150mm x 150mm Base Plate. Complete with security fixing bolts and steel ball inserts. Black hammerite base plate finish. DISC-LOCK- Use your Disc-lock when mobile. Hardened steel lock mechanism to protect against drilling,sawing,cutting. Can be used as a disc-lock. Ideal uses include securing Quads,ATV's,Motorcycles,Scooters, Trailers and Caravans, horse boxes, ride on lawnmowers, plant and machinery. See PJB750 for our NEW Built In option of this product.